Kuala Lumpur, 15 September 2015 – Thousands of hopes shared, hundreds of people reaching out, seventeen days – #seedingMYhope, the social movement aimed at bringing Malaysians culminates tomorrow (Sept 16, 2015) as the country celebrates Malaysia Day. Besides that, a capsule was also driven across Malaysia to collect soil from each state to represent unity in diversity. MyTeksi, the homegrown on-demand mobile application, provided the main transport for the campaign. “For me, the soil from each state may all be different in colour and texture, but they come from the same place – Malaysia. This analogy aptly represents the diversity of our country,” said Niki Cheong, who conceptualised the campaign. #seedingMYhope extends on the 50X50 My Malaysia (www.MyMalaysia50.com) and LimaPuluhTujuh (www.LimaPuluhTujuh.com) campaigns curated by Cheong, a writer and educator in collaboration with Kakiseni. In the past, Niki has brought together groups of content creators – writers, artists, photographers and more – to tell Malaysian stories. With #seedingMYhope, Niki collabored with eight young Malaysians to tell their stories and reached out to other young people to share theirs. “Because hope is about the future, I wanted to make sure that it was the young Malaysians who shaped the campaign. The support that we have gotten from both the public, and corporations such as MyTeksi who jumped on board fully the moment we told them what we were doing, has been overwhelming,” Cheong added. Acting MyTeksi Head Vincent Tan said the company is honoured to be part of the campaign. “It is imperative that Malaysians stand together, now more than ever. We are proud to be part of the #seedingMYhope campaign to remind Malaysians to stick together despite the differences, and it is this unity in diversity that makes our country great,” said Tan. On Sept 16, visitors to Pavilion KL will be able to view the capsule in an installation at the Spanish Steps area leading down to the concourse, where they are also able to “plant” their hopes for Malaysia in a pit of soil. This installation has been on display since Sept 12, 2015. #seedingMYhope is possible thanks to our collaborators MyTeksi, and with the support of Pavilion KL, AFOradio and Kakiseni. 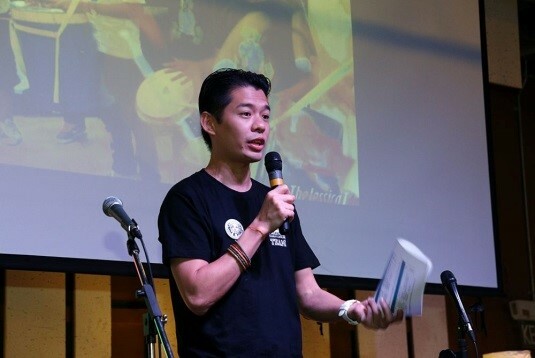 Niki Cheong is a writer and educator, who put together social projects aimed at bringing Malaysians together. He currently pens his fortnightly column The Bangsar Boy in The Star. Niki has, over the past few years, worked on projects including #SayaMahuPicnic, #Fast4Malaysia, 50×50 My Malaysia and more aimed at doing just that. At Kakiseni, we believe that more people should have better access to performing arts in this country — because when more people get together to have the same conversation, it makes for enriching experiences. Beginning in 2001, Kakiseni is made up of a crack team of creative professionals who are intent on making that happen. It’s our job to develop performing arts in Malaysia and then share it with the world. To that end, we’re engaged in activities that nurture audience size and appreciation of performing arts, improve the skills of its practitioners and the quality of their performances, and champion the arts cause to the government and businesses of Malaysia. MyTeksi (known regionally as GrabTaxi) is revolutionising the Southeast Asian transport industry. Our smartphone-based app transform lives by creating safe and reliable rides, and improving incomes. MyTeksi is now the largest and fastest growing taxi booking mobile app in the region, having expanded into 26 cities across 6 countries – Malaysia, Singapore, The Philippines, Vietnam, Thailand and Indonesia – since its launch in 2012.